Could Your Pit be a Therapy Dog? I knew Omega would make a great therapy dog the first time I met her at a Pit Bull Rescue San Diego adoption event. She was on the sidewalk outside a pet store – with the chaos of dogs and people all around – and she only wanted one thing: to cuddle. She was 3 years old and had been picked up by animal control on the streets. X-rays revealed pieces of buckshot lodged in her hind end, and she had clearly given birth to several litters of puppies. While the details of her past were a mystery, her loving temperament was perfectly clear. After adopting her, we completed a basic obedience course and then enrolled in a therapy dog class, which prepared us for the Love on a Leash evaluation test. She passed with flying colors and began her 10 hours of supervised work, visiting seniors and Alzheimer’s patients in nursing homes. Omega is now a certified therapy dog and also passed her Canine Good Citizen test. Since then I’ve met several pit bull therapy dogs. Not only is therapy work rewarding, it’s also an excellent way to help change people’s perceptions about pit bulls. Therapy dogs work in a number of capacities: visiting hospitals, nursing homes, special education classrooms, libraries and hospice patients. Handlers can decide which type of visits are best suited to them and their dogs, and can volunteer as many hours or as few as they have time for. Does your dog have what it takes to be a therapy pet? First, consider his temperament. Therapy dogs must love people of all sizes, shapes, ages and colors. They must be confident and calm. A good therapy pet won’t be easily frightened by new sites and sounds or by sudden movements, and will not be overly excitable in new environments. And because therapy dogs often go on visits in groups or encounter other animals on visits, they should not be aggressive toward other animals, especially other dogs. If your dog has the right temperament, the next thing to consider is his training. Therapy dogs need to be housetrained and know basic obedience, such as walking calmly on leash, and obeying sit, down and stay commands. After passing a basic obedience course, classes especially for therapy dogs can help them learn specialty commands, such as paws up (for placing paws up on the side of a wheelchair or chair) and crawl for crawling up to a patient in a bed. 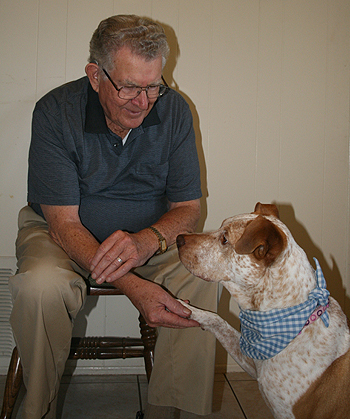 There are many organizations that certify therapy pets. See the links below to learn more. In addition to these national groups, there may be local groups in your area. Find out what groups are active in your area, then ask where they visit and how often. Once you’ve chosen a group that matches your interests and area, find out their rules for becoming certified. Every group has different requirements. Many therapy pet organizations will require that your dog pass the CGC test as well as an evaluation administered by one of their representatives. Some groups will also require that you complete a set number of supervised hours. Joining a therapy pet group and becoming certified has many benefits. You’ll meet great people and be covered by the organization’s liability insurance when you’re out on official visits. And by doing therapy work with your pit bull, you’ll be helping others, showing off how wonderful the breed can be and bonding with your dog. When I put on Omega’s therapy dog vest or bandana, she knows it’s time to go visiting and prances to the car, head held high! Kudos to Micaela and Stubby Dog – article by article, photo by photo, you are making such a difference in the lives of pit bulls. What a blessing to all of us animal lovers.! @Anne Thank you Anne! We couldn’t do it with out everyone’s help and story contributions! I am contributing to the therapy dog industry in an unusual way. Instead of “speaking of Therapy Dogs” I am working on making speaking therapy dogs. I am manufacturing vests for dogs with speakers and an amplifier built in. This means that you can plug your Ipod into your dogs’ coat. It is my goal that this becomes a useful tool for the service dog community. You can find me at http://www.TheWoofer.com. @Jessica Rose that does sound perfect Jessica, let us know what happens. @TamandraMichaels That is extremely generous of you. We would like you to contact us about your project. Please email [email protected]. Thanks! Just an FYI for all the future Pitbull therapy dogs out there…Delta Society is now called Pet Partners. Great article!! @rn4pitbulls Thanks for the update! 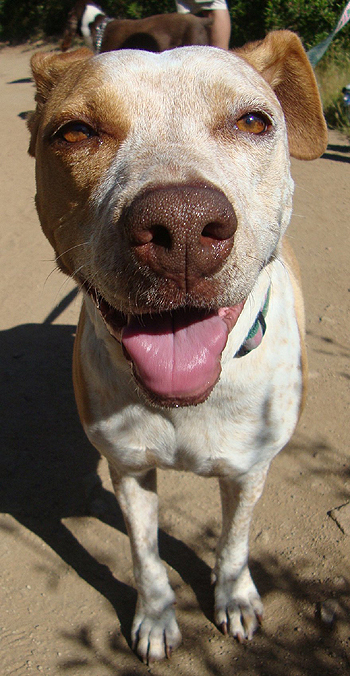 Hank an Australian Cattle Dog (mix of many breeds including Pit) trained himself to be a service dog to me. He would alert me 6 hours before I needed to call an ambulance. He also alerted if my medication level was low or if I was dehydrated. Red Dogg, a Vizsla/Pit Bull (pictured) hasn’t experience my needing an ambulance or low medication levels, but she sure notices when I am under stress and tries to comfort me. She also can tell time and tells me when I am running late. @AndyWhiteman It’s just amazing how intuitive our dogs can be! I think it’s a wonderful thing to do. I want to be a Therapy Dog some day! @WillowWonderBull You would be an AMAZING therapy dog Willow Wonderbull!! !